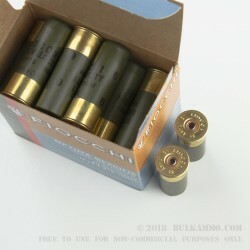 Loaded in Missouri by Fiocchi's US division, these shells come in boxes of 25 and provide an excellent low-cost field load for birds and other small game. 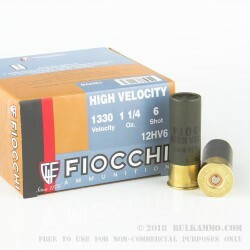 This birdshot load from Fiocchi comes packed with 1 1/4 ounces of #6 birdshot and fires it at 1,330 feet per second, delivering excellent patterns and terminal performance out to extended ranges. 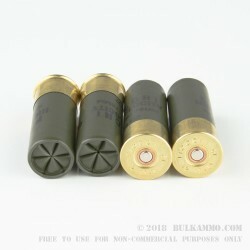 If you want to get some real shooting done, come to BulkAmmo.com. Our warehouse is packed with all kinds of ammo in stock and ready to ship. Great service and quick ship!